LTE (Long Term Evolution) is the project name given to development of a high performance air interface for cellular mobile communication systems. It is the last step toward the 4th generation (4G) of radio technologies designed to increase the capacity and speed of mobile telephone networks. While the former generation of mobile telecommunication networks are collectively known as 2G or 3G, LTE is marketed as 4G. Although there are major changes between LTE and its 3G predecessors, it is nevertheless looked upon as an evolution of the UMTS / 3GPP 3G standards. LTE uses a different form of radio interface (OFDMA / SC-FDMA instead of CDMA), but there are many similarities with the earlier forms of 3G architecture and opportunities for re-use of some elements of 3G network architecture. LTE can be seen as providing an evolution of functionality, increased speeds and general improved performance compared to 3G. 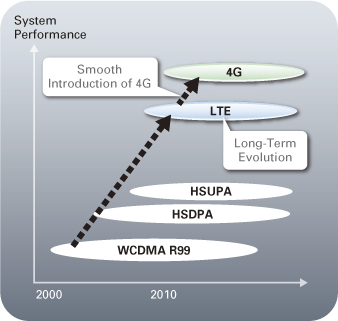 LTE has introduced a number of new technologies when compared to previous cellular systems. They enable LTE to operate more efficiently with respect to the use of spectrum, and also provide the much higher data rates that are now required. OFDM technology has been incorporated into LTE because it enables high data bandwidths to be transmitted efficiently while still providing a high degree of resilience to reflections and interference. One of the main problems that previous telecommunications systems have encountered is that of multiple signals arising from the many reflections that are encountered in antenna deployments. By using MIMO, these additional signal paths can be used to advantage and are able to be used to increase the throughput. With the very high data rate and low latency requirements for 3G LTE, the system architecture must evolve to achieve the performance improvement benchmarks. One change is that a number of the functions previously handled by the core network have been transferred out to the periphery. Essentially this provides a much "flatter" form of network architecture. In this way latency times can be reduced and data can be routed more directly to its destination.